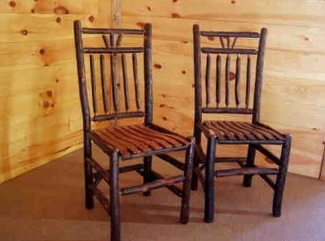 Our chairs are made here in upstate New York exclusively by our own craftsmen. 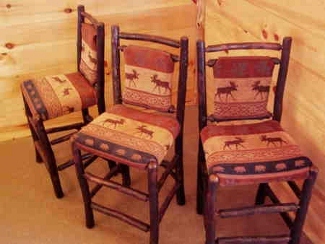 We usually have over a hundred chairs in stock for you to choose from or we can make whatever you would like in two to four weeks. 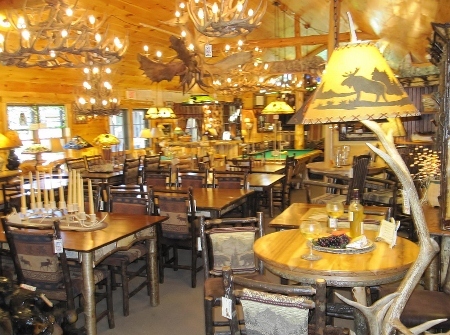 We take pride in our chairs because we supervise the construction from start to finish, making sure that they are of the best quality. 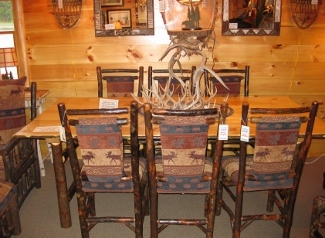 Our upholsterer will do expert workmanship using fabrics that you have selected from our patterns or yours, ranging from traditional to lodge designs. 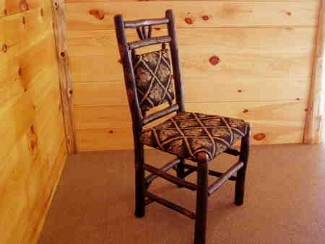 All our upholstery fabrics are chosen for quality and durability and will be enjoyed for many years. 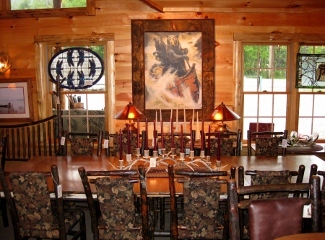 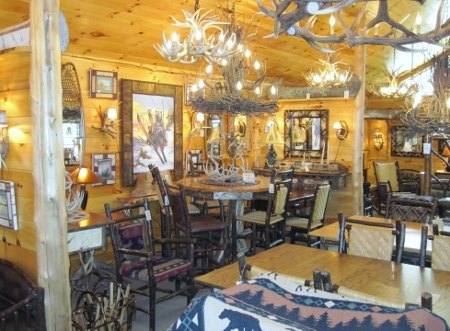 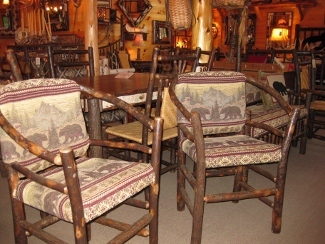 We offer many choices for you in wood chairs. 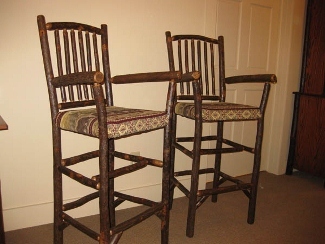 We have many styles: spindle back with slat seat or woven seat, 3 fingered spindle back with woven or slat seats, 3 fingered woven or upholstered seat and back, solid upholstered or woven seat and back, etc. 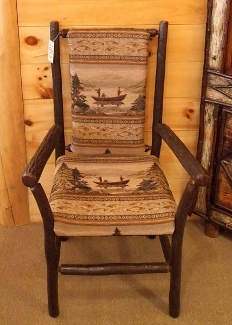 Captains' chairs are available also in each style. 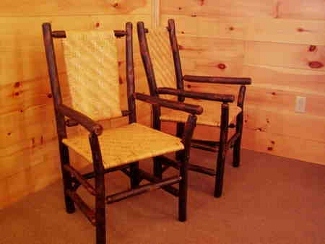 Our custom-made hickory chairs are priced from $195.00 and each will be upholstered to your order. 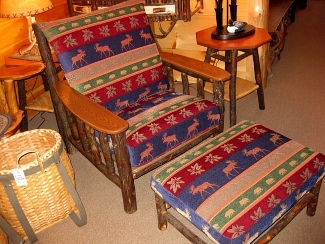 One of our signature pieces is a design we call the Big Moose Chair with a matching ottoman. 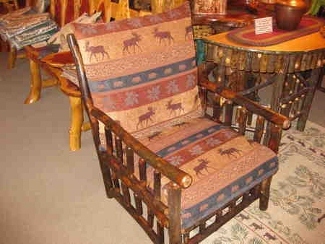 This unique piece is made with an extra wide seat area and wide side arms making this style chair very roomy and comfortable. 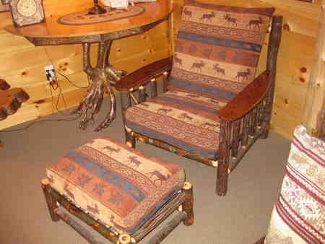 We are now making our very popular "Big Moose" style in a sofa and loveseat, with your choice of fabrics and cushion comfort level. 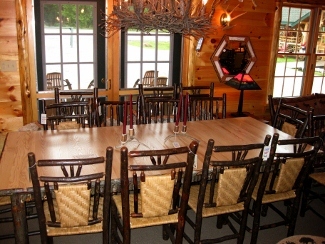 We always use tried-and-true mortise and tenon joinery on our furniture for strength and durability. 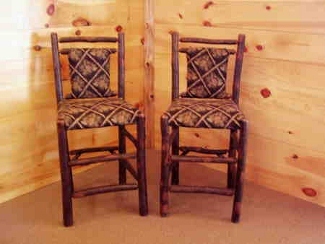 The chair seat width can be adapted to your comfort level from a regular-sized seat to the larger seat. 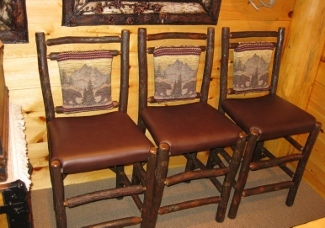 Our upholsterer can give you a choice of cushion comfort from extra soft to extra firm to make your seating "comfort perfect."